TECNAN has been awarded a 10 years durability certificate by QUALICONSULT group for its ‘non-stick’ glass surface protector VETROMART after exhaustive accelerated aging tests. The hydrophobic and anti-lime treatment of TECNAN specially designed for glass surfaces with direct application to shower screens, windows or glass curtain walls among others, has passed satisfactorily the demanding tests required, performed by the well-know laboratories of TECNALIA, and it is approved and certified by the specialist group QUALICONSULT for 10 years durability based on a very complete procedure of accelerated aging tests. To get this certified durability of 10 years, the accelerated aging tests performed have consisted of a very complete procedure based on UV aging, chemical attack, thermal shock and abrasion tests. VETROSMART is a transparent hydrophobic solution which provides the glass with easy-to-clean properties, creating a protective barrier against liquids, lime and other dirt stains, therefore preventing its accumulation and reducing the subsequent cleaning tasks. The key of the VETROSMART treatment of TECNAN is its impressive quality-price ratio, which makes it a really attractive alternative within the professional sector for companies such as shower screen manufacturers, glassware workshops and glass installers among others. 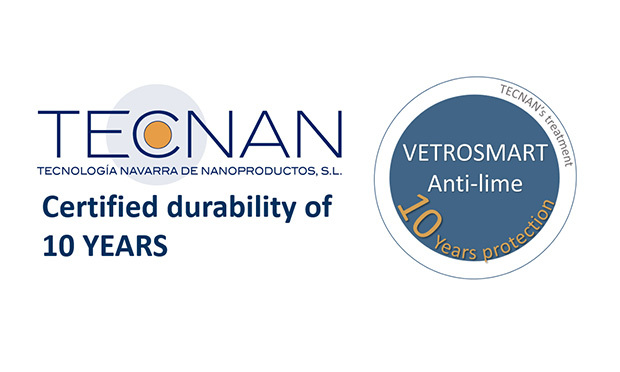 It’s possible to ask for a sample at tecnan@tecnan-nanomat.es. In essence, high quality at a very competitive price is the key which makes the TECNAN products extremely successful in the market, being present worldwide. The quality of the glass products manufactured by TECNAN is also conclusively proven by the success of its rain repellent product for cars windscreens, Tecnadis GWR, which reaches an 85-90% share of TECNAN’s home market for the professional sector of windshield replacement and repair. This product is being used massively by important companies such as CARGLASS Spain, which has selected this treatment for its anti-rain campaigns during 2017, 2018 and 2019.